Today, website accessibility has become one of the hottest topics of discussion among web developers all over the world. Website owners have become more concerned about their site’s accessibility via devices other than the standard desktop and laptop screens. This growing concern among website owners has given birth to a brand new form of web design called the Responsive Web Design. With mobile devices and tablets gaining grounds at a faster pace, it’s become mandatory for every entrepreneur to ensure that his/her website is responsive and compatible with all internet-enabled devices. Although, both, Adaptive Web Design (AWD) and Responsive Web Design (RWD) render mobile-friendly websites, you might be wondering as to what makes them two separate entities. Well, I’ve written this article to make you familiar with these basic differences between an Adaptive Web Design (AWD) and a Responsive Web Design (RWD). Both, Adaptive Web Design (AWD) and Responsive Web Design (RWD) render mobile-friendly websites. An Adaptive Web Design (AWD) uses the server to detect the device that’s been used for viewing the website. In other words, the sever will be used for determining whether the website is being viewed via a desktop, a smartphone or a tablet. A separate template is being maintained for each device i.e. the template displayed while viewing the site on a laptop screen will be different from the one that’s displayed when the same website is viewed on a smartphone screen. Since websites designed using the adaptive web design are housed on their own domain, the web pages load at a much faster rate. A Responsive Web Design utilizes a specific CSS code to modify the website’s presentation as per the device it’s been viewed on. Information regarding each device is being downloaded irrespective of whether it’s used or not. Quite unlike the websites designed using an Adaptive Web Design, the ones designed using a Responsive web design load at a slow speed. 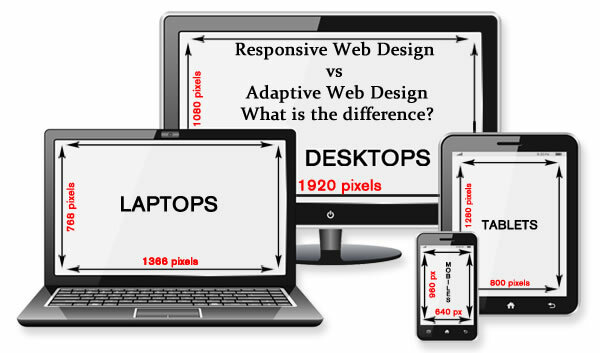 What’s the difference between Adaptive Web Design and Responsive Web Design? The very first difference between Adaptive Web Design and Responsive Web Design is that the former one will thoroughly change to fit the screen and device dimensions whereas the latter one will fluidly change and respond to fit a set of devices and screen sizes. Here’s a list of other noticeable differences between an Adaptive Web Design (AWD) and a Responsive Web Design (RWD). 3. While adaptive web design (AWD) relies on predefined screen sizes, responsive web design (RWD) relies on flexible and fluid grids. In other words, RWD requires more coding and implementation strategies to fit the web pages of varying screen sizes whereas AWD already has a streamlined approach wherein web pages utilize a scripting in order to adapt to various screen sizes. 4. Adaptive web designs are implemented on a pre-existing site whereas in case of a responsive web design, you need to rebuild the site from scratch. 6. Websites designed using AWD have images that are optimized for specific device screen resolutions whereas the ones designed using RWD contain images that are first downloaded and then re-sized to fit the respective device. Irrespective of whether you choose AWD (Adaptive Web Design) or RWD (Responsive Web Design) for your website, it’s important to have a strategy behind designing the site for mobile device constraints. You need to ensure that the site’s content is optimized for audiences no matter what device is used for accessing your website. To sum it up, your website must have a design that stands out from the crowd. This entry was posted in CSS, Resources, Responsive Design and tagged CSS, Web Design, wordpress. Bookmark the permalink.